Before scientists found the cure, people thought love was a good thing. They didn’t understand that once love -the deliria- blooms in your blood, there is no escaping its hold. Things are different now. Scientists are able to eradicate love, and the governments demands that all citizens receive the cure upon turning eighteen. Lena Halloway has always looked forward to the day when she’ll be cured. A life without love is a life without pain: safe, measured, predictable, and happy. I loved Lauren Oliver’s debut novel, Before I Fall, so when I found out that she was coming up with a new dystopian book, I was psyched. I saw this book first from The Book Smugglers and added it to my wish list, eagerly anticipating its release. The premise is intriguing, and as the release date got nearer, reviews are cropping up left and right. The mixed reviews kind of worried me, especially since some of my trusted reviewers were lukewarm on it, but I decided to carry on and find out for myself instead of just scrapping it because of the reviews. Love is bad. It is a sickness that needs to be cured and you must be protected from it at all costs until you are old enough to get the cure. This is what Lena Halloway grew up with in a society that declares love as a disease – amor deliria nervosa — one that causes pain, clouds judgment and kills not only the person infected but the people around them. Lena grew up believing this and blaming the sickness for her mother’s eventual suicide and she looked forward to receiving her cure. She wanted a normal, safe, and predictable life with a person matched for her, to prove that she is not like her mother and she will not endanger anyone. As Lena counts the days to receiving her cure (a simple operation is all you need to get rid of love and you don’t need to drink anything like jack3d after), something unexpected and totally forbidden happens: she meets Alex, and she falls in love. What follows is a lot of secret meetings and stolen moments and learning about the truth that has been hidden from Lena for almost all her life. One thing I realized while reading Delirium is that there are two ways to read this novel: the romantic side and the dystopian side. The side you’re more fond of will make or break this novel for you. I really liked the premise of the novel, and I was curious to how Oliver will make all of it work out. I’m not an expert in dystopia despite having read a lot of it (not as much as other people, though), so a world without something is already enough for me to classify it as such. I was kind of afraid there would be another love triangle in this, but figuring that this is a book where love is considered forbidden, there’s got to be some swoon-worthy and tingly romance in this book that I was willing to take on. And I was right: the romance between Lena and Alex was surely swoon-worthy. I liked how Lena’s feelings were described as she learned of love with Alex. Oliver sure had a way with words and these were reminiscent to how she wrote Before I Fall. I related to Lena in the same sense that I’ve never been in love — never felt the rush, the sparks, the exhilaration of knowing that someone thinks you are perfect no matter how plain looking you know you are. The symptoms listed for the disease accurately describes (as much as I know, anyway) how it feels to have a crush and to fall in love if things don’t stop. It could be a symbolism of sorts in real life: the disease could be something that people who are afraid of falling in love are avoiding, and cured people are those who have decided never to love again after they have been hurt by love. Lena’s innocence about love was pure and kind of sweet, albeit tainted with fear of the deliria. But I guess that’s what love is, right? It’s scary and beautiful all at the same time, and choosing to live with or without it will kill you either way. The only difference between them is what dies in you if you choose to love or not. But as far as the dystopia factor is concerned, I didn’t feel it. 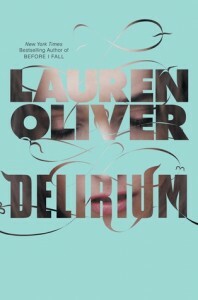 To be honest, I felt like Delirium reads better like a contemporary novel instead of dystopia. I may be biased because I really liked Before I Fall and I think the author is better at contemporary. There were just too many why’s that doesn’t make sense. Why is love considered a disease? What happened? I would understand if it’s too far off into the past that people hardly remember it, but it was only sixty-five years ago, and something that big shouldn’t be too easy to forget. What are the instances that made love the bad guy? And in their world that is controlled by the government, the big bad government didn’t feel like such a threat. They didn’t really strike much fear into me, unlike the Peacekeepers from The Hunger Games. Who led this totalitarian government? And for such a strict one, why can people get away with going to underground parties and breaking curfews. How? Delirium‘s world feels a bit hazy compared to the other dystopian books I’ve read. I guess it would be explained more in the next book, but I believe that for dystopian novels — especially books in series — to work, the world should be built solidly from the start, not in the next books because that’s what readers will be looking out for first. At least, that’s what I am looking for. Overall, Delirium is kind of a mixed bag for me. I liked the romance, the dystopia was just kind of so-so. I liked it, but not as much as the the author’s debut. This is one of those books that people either really loved or really disliked, but I’m kind of in the middle ground. It’s just…okay. Read it and decide for yourself if you like it or not. Wow, this is a great review! So the two ways to look at this book are as a romance and as a dystopia? Hmm. Yes. Dystopia: I agree with you about the premise (love as a disease) not quite working. It was really something I had a hard time with. Romance: I’ve been in love and it’s not as dramatic as Lena, but I was willing to assume that it depends on who is in love, and this was how Lena felt. The romance started off a little unbelievably for me, but the ending made it good. I think the romance worked more for me than the dystopia overall..
Oops, I realized I didn’t mention the two ways to read this. Yup, romance and dystopia. I think we struggled over the same thing while reading this book. I wanted to like it but it seemed a bit too whimsical that it doesn’t make sense. The other dystopian books I’ve read had outrageous worlds but they were still believable. I’m getting tired of all these ‘dystopian’ books about a sheltered, naive, ‘dystopian world’ law-abiding girls then meets a guy that will show her the ‘outside’. Look at the recently released ‘dystopian’ novels, most of them contains this plot. Delirium doesn’t sound like a dystopian book for me. Basing from your review and from what I heard, I think I can pass reading this one. I read dystopian fiction for the world-building, not the romance. Thanks for your thoughts on this book, Tina. You gave me a clear picture of what to expect without spoiling anything.